Ever since the NYTimes revealed that even otherwise reputable authors like John Locke had bought reviews in the Kindle Store I have been wondering when how long it would be until the next time a similarly sketchy service reared its head. How would you like to buy your way into the Kindle Store best seller list? There's a website that claims it can help you do just that. 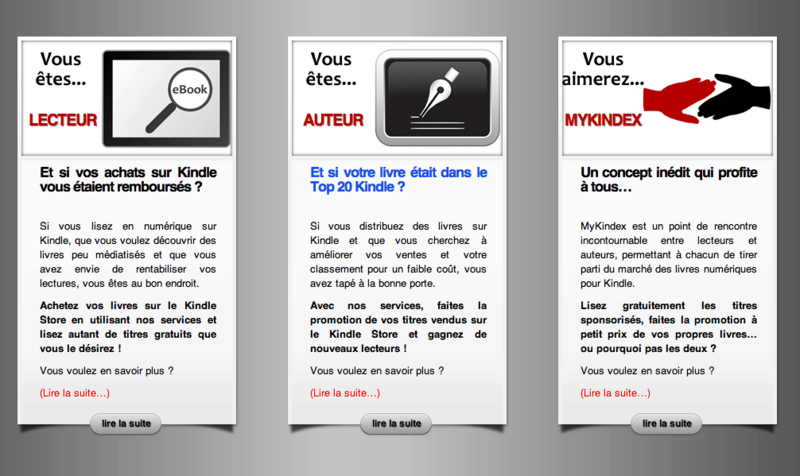 Last week a reader tipped me to a French site called MyKindex. This site, which at this time is focused on manipulating the French ebook market, promises to offer authors the opportunity to buy their way on to the French Kindle Store's best seller list. And if the report in the French language KDP Newsletter is accurate then the service appears to work, too. In a way, MyKindex is a lower-cost, low profile simlar services that promise to buy your way on to prestigious best seller lists like those of the NYTimes or WSJ, and its a fairly straightforward operation. Authors pay readers to buy their ebooks in the Kindle Store. There is a registration fee for authors, but the service is completely free for readers. There's not even an obligation for readers to follow up with a review, though it is suggested. Actually, this service is better than free; readers who buy the ebooks get the ebook plus 20% of the price they paid. All of that money comes out of the pocket of the author (plus another 5% of the selling price of the ebook for MyKindex). MyKindex also appears to be rejecting some ebooks. According to their website (and confirmed by Actualitte). They exclude ebooks which have formatting, grammar, or other complaints. I have not used this service myself; the English language service hasn't launched yet. But I do know that MyKindex is not unknown in France. In fact, at least one KDP author is reportedly very pleased with the value she received. Le plus difficile restait cependant à venir : le marketing. Le savoir-faire (en l'occurrence le « savoir-écrire »), c'est bien, Mais sans le faire-savoir, ce n'est rien ! Or, comme la plupart des auteurs, je ne sais pas me vendre et je déteste cela (même écrire cette rubrique est une petite torture…). Des amis dévoués, l'entraide et l'échange de conseils entre auteurs autoédités, puis un appréciable coup de pouce de MyKindex, m'ont aidé à me faire connaître. Nuit Blanche a atteint la 3e position au classement général des ebooks sur Amazon, et la 2e dans la catégorie « Policier et suspense ». Même si son score fluctue depuis, cette performance reste un immense bonheur. La vingtaine de commentaires, très élogieux, aussi (non, ils n'émanent pas tous d'amis !). Et les seules critiques portent sur le fait que… c'est trop court ! Je trouve cela extrêmement flatteur. You gotta wonder how Amazon let that story go through without a fact check, don't you? This story hasn't broken yet in English language blogs, but Actualitte has been covering it in French. Yesterday they posted an interview of Sébastien Cerise, the founder of MyKindex. He defended the service, and argued that it was not breaking any of Amazon's rules nor was it breaking any laws. That could well be true, but I expect that Amazon will take steps to block MyKindex. It might not violate the letter of any of Amazon's rules but it does render the best seller list suspect. That damages Amazon's credibility, and I don't think they'll like that. And even if Amazon doesn't block MyKindex, they could jigger their algorithms so it is less effective. Remember, authors used to be able to offer an ebook as a freebie for a short period and see a huge positive effect on their Kindle Store rankings. That is no longer true; Amazon changed their algorithms so free copies have less of an effect on Kindle Store rankings. Amazon has been queried on this story, and should they respond I will amend this post. Just as a precision: this could not work on the american and british Amazon sites. That service relies heavily on the fact that the french ebook market is still very small, meaning that just a few dozen sales is enough to get you in the top 100, and just a few more to get in the top 20. That’s why that service is so efficient, but that’s also why it cannot work on the long term: the more the service is used, the more sales will be needed to get in the top 20. Combined with the normal growth of the market, authors will soon have to pay thousands of dollars to get in the top, compare to 150€ today. But I hope Amazon will forbid that site before we get to that point. You would need approximately 1,200 – 2,000 sales to hit the Top 20 in the US. I can’t imagine these guys could rig up enough dummy accounts to make that happen. And I’m pretty sure Amazon will stomp on this pretty quickly – as they should. It looks to me like MyKindex is based on real users, not fake accounts. I think it would be pretty easy to find 2,000 Kindle owners who would want to be paid to get free ebooks. If it’s based on gifting books to real accounts, then Amazon can kill that pretty quickly. I believe that authors used to be able to gift to multiple users and that would count towards ranking, although I think it no longer does (probably because of people gaming the system in a similar way). The cost would be pretty high in the US too. If your book is at 99c, the minimum cost would be $2k plus whatever fee the company would charge for the hassle of mailing to 2,000 accounts (which would take some time via Amazon’s gifting interface). If your book was $2.99, then you are talking $6k plus the fee. Aside from that, the Amazon algos are pretty well developed (in the US) to recognize such an artificial one-off sales spike and push the book down just as quickly, so the benefits would be very limited. All of this is aside from ethical questions of course, as well as any considerations of it being against Amazon’s ToS – and that’s written with enough wiggle room to allow them to do pretty much anything when it comes to something like this. It could perfectly work actually: I’m sure you can find a lot of self-published authors ready to pay a thousand dollars to reach the top 20. Richer authors, yes. But I’m sure you can always find customers ready to pay. Amazon has to make it stop right now, or its rankings will soon become the property of other companies. It not could work, it will work ! Imagine that Amazon stops MyKindex with any reason or tool. Now that the idea has been widely spread out, some authors will have the idea to directly buy some dozens of e-books and to see their ranking increase. In fact, the best solution would be for the French e-book market to increase its penetration and the volume of e-books sold.